We are busy preparing the next Granary reunion with the intention of making it the best yet. 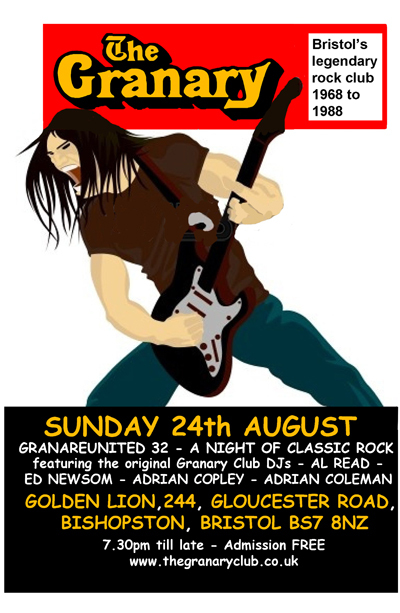 We do hope you can come along, bring your friends and wallow in the special kind of rock music that made the Granary legendary! DJ Supered has sent his Santa suit to the cleaners and has already planned his “Super Ed Super Set”. Ed’s theme for the first section of the evening is “1970’s & 1980’s tracks by bands that played at the Granary and are still gigging today in one shape or another.” For instance YES then and now. Many of the bands featured in this new book played at the Granary in the late Seventies and Eighties. The Cortinas and Looney Tunes on the same night in November 1979. The Spics in September 1979 and, of course, Granary appearances by many more new wave Bristol bands like Vice Squad, Vitus Dance, The Rimshots, Court Martial and the Hybrids. Add this book to your Granary Club book (and the fine Bristol Folk by Mark Jones) and you’ve got it covered! 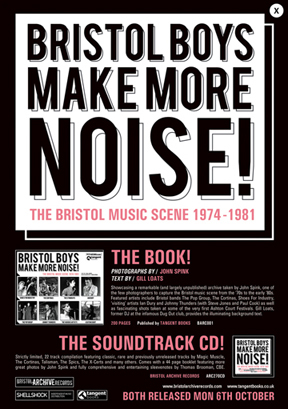 Bristol Boys make More Noise is published by Tangent Books £14. 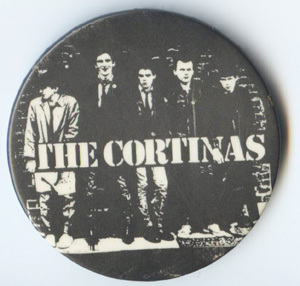 PS - And I’ve still got my Cortinas badge! 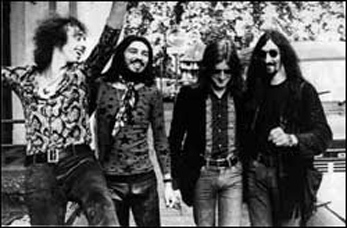 There was a series of progressive rock nights featuring Bristol based East of Eden at the Dugout in the late Sixties. When the Dugout became to small to handle the ever increasing crowd and the blues and rock bands that took over when East of Eden left Bristol, a move to the Granary organised by Mike Tobin began a new era. The other three of the four original Granary team members, Al Read, Terry Brace and Ed Newsom, were with East of Eden and had fleeting moments of being “almost famous”. One of these was appearing in a film directed by Tony Richardson (Look Back in Anger, Tom Jones, The Loneliness of the Long Distance Runner, Charge of the Light Brigade and many more). The film was Laughter in the Dark which originally had Richard Burton in the lead male role. He was, however, sacked and replaced with Nicol Williamson. The film was released to cinemas in London but there were bad reviews and and a furious Tony Richardson withdrew the film and destroyed the copies. Since that event in late 1968 no copies of the film have been found. Posters, handouts and press information survived but tere’s no mention of East of Eden on any of these. No way of proving we were even in it! Until a few weeks ago. A prog rock colleague in Poland came across a still from the film. Al is on vocals with Terry Brace on bass. 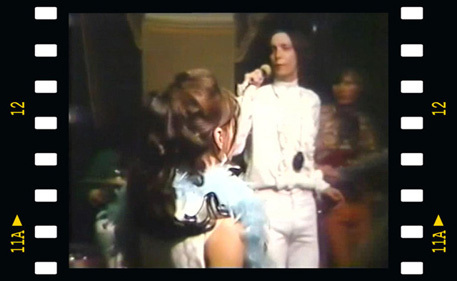 The lady with her back to the camera is leading lady Anna Karina and Al can confirm that it is definitely him in the flouncy white shirt. If you know where there is a copy of the film is please let us know! 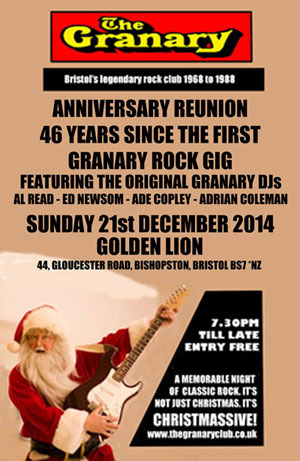 Next Sunday at the Lion we will be celebrating our thirty second Granary Club reunion and we want your company. We must warn you that there might be bad language, adult themes and flashing lights but who cares… it’s rock n roll! It’s free admission so tell your friends and neighbours to come and be be prepared to indulge in the best of classic rock. The following day is a Bank Holiday (or as we know it …recovery time) so as most of us will have a day off we can take advantage of the pub price beer! Granary memorabilia adorns the walls and there are copies of the Granary book at sale price that you can get signed by the Granary DJs. Make an early arrival at the Lion in order to catch every classic track but, whatever you do MAKE IT! See you there mateys. Lubin (Lem Lubin saxaphone with jazz rock band Satisfaction - Granary dates in 1971 to 1973) is still a great mate, retired and living like me in darkest Wiltshire….you’d be surprised who comes creeping out of the woodwork around here…Oddly, although most things about the Biz(before it became an industry) were odd, I worked for both Chrysalis and Revolution as well as Starlight. 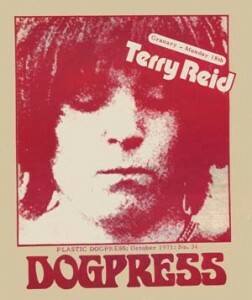 Although the word ‘worked’ does suggest we got paid…….you very often couldn’t move for Egos…….I remember Brinsley Schwartz ,Quintessence ,Gentle Giant ( who I went on the road with …I think) Terry Reid,now THERE was a set of pipes..
Big thanks to Mike Reed, we look forward to another collection of his Granary memories soon.